On Wednesday, Citizens Financial Group announced their plans to build a corporate campus on a greenfield site in Johnson outside Route 295, while maintaining their current corporate headquarters in Providence. As reported by WPRI, the 420,000 square foot campus will house 3,200 employees. Construction will start this year with occupancy in 2018. 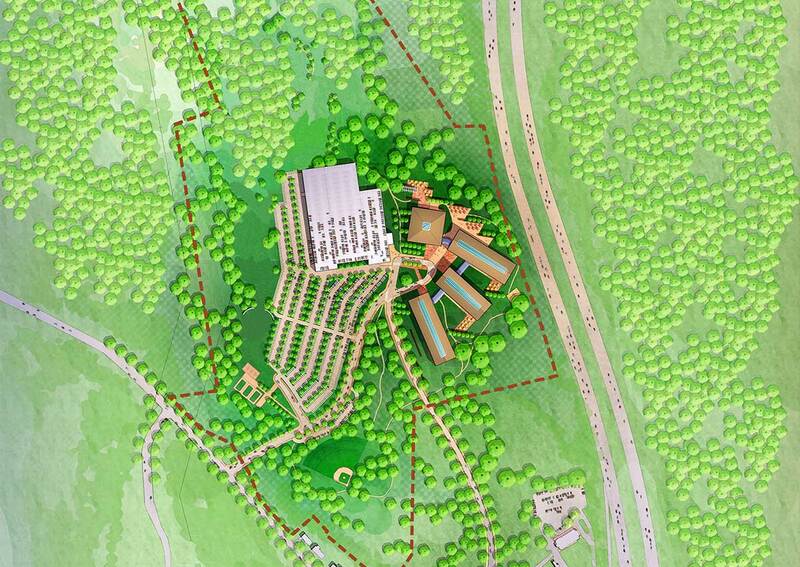 Rhode Island Public Radio reports the campus will feature an on-site cafeteria, fitness center, and walking paths. Didn’t we just pass a super-controversial bill to toll trucks because RIDOT can’t afford to maintain what it has now? Now RIDOT is building infrastructure for private development? The Narragansett Bay Commission will pay to extend its sewer line that now runs underneath Hartford Avenue near Salina Avenue, spokeswoman Jamie Samons said. Costs haven’t been determined, but design work will begin almost immediately and the project will probably go out for bid next fall or winter, she said. I’m pretty sure my sewer bill keeps going up because Narragansett Bay Commission cannot handle everything pouring into it’s system now. But NBC (through us, the ratepayers) is going to build out new sewer lines into greenfields. Look, keeping these jobs in Rhode Island is of course great. However, Citizens has said they had no intention of moving, but thanks for all the free stuff! Paving paradise and putting up a parking lot in the middle of the woods out in Johnston is not good for the Rhode Island economy. Building exit ramps further and further from the urban core, encouraging more cars onto our highways is not good for our economy. There is no RIPTA bus service on Greenville Avenue (RIPTA’s trip planner says it is a 54 minute walk to the nearest bus stop), how many current Citizens employees will have to find new jobs because there’s no bus for them anymore? Not to mention there is no chance of any other employees giving up their cars for transit. Every employee will have to get into a car to get lunch or do errands off campus. It sure would have been nice if they had found some place in Providence to build, but it really would have been nice for them to locate almost anywhere but here. There are places nearby in Johnston itself which would have been infinitely better, with existing highway access, sewer service, and transportation alternatives. The town could have got a vacant or under-used non-greenfield parcel redeveloped and 3,200 workers could have help infuse life into an already developed area. What Johnston gets is a bunch of people who will be hiding in the woods, eating lunch in their cafeteria, barely aware of what town they are even in. If only our civic and business leaders had the vision and common sense to see the problems with this development. Instead they are all falling all over each other, rushing to be the first and loudest to shout “JOBS!” into the nearest microphone. RI-NPR on-line had a story about this with several negative reaction comments posted about how this is all about sprawl, undermines transit and land use goals. RIDOT will have to go for a TIP amendment to gett eh itnerchange which is an opportunity for public protest. I think they also need special FHWA approval for a new interchange on an interstate. Citizens Bank should here from customers. I for one will do that and maybe rethink having accounts with them. Wow, surprised and encouraged to see all those pro-urbanist, pro-smart growth, anti-sprawl comments on a mainstream news website. Love that Citizens is staying. Hate that so many resources are going to waste with this proposal. So many locations already have infrastructure in place. How backwards of Rhode Island. This makes me think about all those tech companies that locate their headquarters in office parks in outer ring suburbs of San Francisco except most of Johnson is just forest and ultra low density sprawl. Most of providence’s suburbs have urban cores that are zoned exclusively for the automobile and thus results in those areas being economically unviable. You’d think that those suburbs would capitalize on the fact that they have somewhat of an urban core. Anyways I really don’t understand how this can be allowed when the RI gov supports Rhodeworks, which is has pro-urban, pro-Urbanist, pro-Walkablity guidelines. RI deserves better than a corporate campus located deep in the woods. Missed opportunities both for Citizens and Rhode Island. If I had an account with them, I’d try to stage a boycott over this, but alas, I have no leverage in the matter. Something needs to be done though. As much as I wanted them to fill the Superman building, a building downtown would be a tough sell compared to this, where would you rather work? In these kinds of deals we always need a close look at who owns and who gee whiz just happened to recently buy land and options for strip mall sites along once sleepy Greenville Ave. It’s gonna be classy! Johnston NIMBYs have fallen down on the job. Agree with all points except the loss of employees who don’t have cars. The Cranston and East Providence offices are already largely staffed by people who drive to work in less than 10 minutes. My guess is that those workers will try to find something closer to home, and their jobs will be filled by those who live a 10 minute drive from the Johnston campus. A Citizens move to Providence would have come at the expense of even more workers who prefer this commute. From this you can surmise that Citizens prefers this kind of employee, and is not interested in attracting the kind of talent that is not afraid to be in a city and use public transportation. What “kind of people”? Ones that cost less. Please keep us updated about the TIP and other opportunities to stop this development. This is definitely protest worthy and I, for one, will not sit idly by while our officials and governor allows/ encourages this type of destructive, suburban development! You want reasons why this state is doing so poorly, look no further than this type of terrible planning. It only exacerbates the current issues we face as a state and actively lowers quality of life. Zero of our tax dollars should be going to this! We should not have to foot part of the bill for a new highway ramp, sewer line, and tax stabilization. If they choose to build like this, they need to know we won’t allow our taxes to be spent on a private corporations bad development plans. I’m about ready to start a revolt. Wake up Rhode Island!!!!!! Other than their Downtown headquarters, the culture at Citizens may indeed be suburban. 3,200 jobs is nothing to ignore. The financial group could have decided to have its back office operations leave the state. Even so why would they choose such an isolated greenfield site in Johnston that has very little potential to ever be served by transit? I assume the need for 3,200+ “FREE” parking spaces. The station area around TF Green Airport would have been an excellent fit. The airport location, which is a suburban, not only has good highways, but has the added advantage of both train and bus service. It’s not too difficult to imagine Citizens employees traveling back and forth between the two office locations using the train. I suppose it must be because Citizens, as well as Rhode Island government officials are not visionary. Even in terms of suburban, isolate locations there’s plenty of places looking for a large development such as this one that either have transit now or are straight in the line for reasonable transit extensions later. TF Green and the wasteland surrounding it could have gotten this easily. Wickford Junction, still waiting for any kind of development at all to anchor that place, could have gotten this easily. The most superior railway-freeway access point in the state, just off 403 in Davisville, would have been an incredibly visionary move to make. None of those places are getting this development, ostensibly (if you asked Citizens) because of the “suburban culture” of the workforce this campus is meant to house and probably because of well-polished traffic/commute studies designed to make the case for this location as affording the best commute possible to Citizens army of driving office workers. But in this particular case, it’s important to note the way that modern “suburban culture” is actively hostile to both transit and cities, filled with “the wrong sort of people.” Even in Johnston, a superior location is to be found within spitting distance of the site that was chosen: the intersection of 6/6A and 295. The current vision for bus lanes on 6/10 is a terrible one, but nevertheless, a transitway on the Route 6 corridor is far more likely to get built some day than any transit that could’ve served the Greenville Avenue siting. In the meantime, fixing that terrible interchange ought to be a priority item on the state’s road infrastructure list, and if they can find the money and will to create a brand new exit where none is need they can sure re-align and widen a few ramps. The transit argument for US-6 remains unconvincing to me (I don’t believe the Providence-Hartford interstate will ever get built, and absent a multimodal corridor like that, the superior alignment for Providence-Hartford rail runs over largely existing trails/reservations like the Washington Secondary and goes nowhere near US-6 for most of its life) but nonetheless, 6/6A is not an impossibility for transit the way that this place is, and the highway access from Providence as well as from 295 is or could be made much better today, and should be independent of building Citizens a new suburban shelter. But the problem is Citizens doesn’t think current or hypothetical access to/from Providence is an advantage. Actually, in the case of the “suburban culture” that Citizens is after for this site, Providence access is a problem and a drawback. $6 million for a new interchange looks pretty lowball to me. It certainly does not include new signals, turning lanes and widenings that will suddenly be needed all up and down Greenville Ave. When the costs get added up, $3M will be a lot less than half. Plus, in nearby states, suburban office campuses like this have already become unwanted, un-repurposable and obsolete. Statewide Planning & Growth Planning Council have consistently stated that public money should not be spent on projects that are not served by existing infrastructure. Here we seem to be spending money on new infrastructure for a poorly located private facility. This is back office space; however should not be spending public dollars on this kind of thing. At a “roundtable” meeting today between Environment Council transportation activists and their friends with RIDOT staff and its Deputy Director, it seems not only is RIDOT OK with this project and its interchange (they said policy is to have a “balance” of transit oriented development and suburban highway development) but if they use only state money for the $3 million, they won’t need a TIP amendment, nor is there any mandated Federal environmental review since Federal money wouldn’t be used. So it is possible there will be no public input into this at all. No use blaming DOT, they are an exec branch agency following orders from the Gov. The fault lies mainly in the Citizens Bank decision. How backward. Remember GE? They dumped Fairfield because people don’t want to work in suburban campuses surrounded by parking lots anymore. There are a whole load of Rhode Islanders (usually a little older) for whom the thought of driving into Providence for work or anything else is a horrifying thought. “No place to park,” they’d say — by which they mean, “No place to park for free.” Citizens is no doubt driven by this. Not exactly a young, hip company with young folks who’d rather not sit behind the wheel. For these folks, the car is freedom from the hassle of a bus or train schedule. Until we have better commuter transit options into and out of downtown PVD, that isn’t going to change. These aren’t people who think it’s fun, interesting, green, or thrifty to go a little out of their way to take transit. It needs to be convenient, and part of the culture. We need the options and a culture shift will eventually follow. Then, when it’s just a given that people commute into/out of the city on rail and bus, like in Boston, that culture shift will occur and things like this Johnston development won’t happen as often. May 26 is the date of a public hearing on a TIP amendment (#7) that puts the interchange into the current TIP so we do get a chance to officially weigh in. However, it is part of a complicated 110 page Amendment and remarkably, it is listed in the “Traffic Safety” section. Further, the hearing is also about a 378 page draft TIP for 2017-2025 with many many features. It seems the public review of our multibillion 10 year transport plan is largely very limited though individual little projects might get some attention. For now, I’ll only note the “Transportation Alternatives” section (bike and pedestrian programs, safe routes to school, enhancements, recreational trails) gets only about 1.8% of the funding in the 4 years 2017-2020 that really count though higher levels are projected later. RIPTA capital is more or less at current levels though the one-time enhanced corridor and voter-approved bus hub money is figured in as part of amendment 7 in FY 2016.